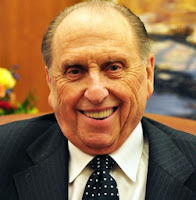 President Thomas S. Monson (1927- ) was sustained to the Quorum of Twelve Apostles in 1963. He served as a counselor in the First Presidency with Presidents Benson, Hunter, and Hinckley until becoming Church president in 2008. "Our Father provided the sun, the moon, and the stars—heavenly galaxies to guide mariners who sail the lanes of the sea. To us, as we walk the pathway of life, He provides a clear map and points the way toward our desired destination. He cautions: beware the detours, the pitfalls, the traps. We cannot be deceived by those who would lead us astray, those clever pied pipers of sin beckoning here or there. Instead, we pause to pray; we listen to that still, small voice which speaks to the depths of our souls the Master's gentle invitation, 'Come, follow me.' (Luke 18:22.)" 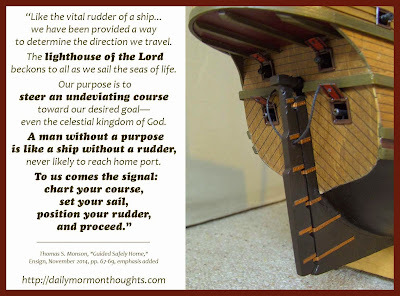 President Monson loves the imagery of lighthouses, the sea, and navigation. In this recent example, he links the ability to direct our lives with the image of a rudder; lacking a rudder is like having no purpose in life, and thus no ability to navigate. There are some key words in this quote, such as "vital" and "undeviating" — a reminder of the need for constancy and faithfulness. He goes on to remind us that a loving Heavenly Father provided his children with a variety of "navigation aids" that can help us make good choices in life and stay on the proper path, avoiding "the detours, the pitfalls, the traps." The key for us is to choose to heed them by following the Savior in every way.